(San Francisco, CA) – 21st Amendment Brewery has appointed Dave Wilson as the company’s new partner and President of the popular craft beer company. 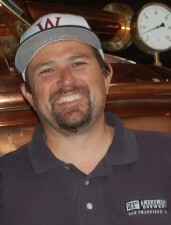 Wilson, who has been with the 21st Amendment team since 2008 began as their National Sales and Marketing Director when the company first launched their packaged beer on to the market, making 21st Amendment one of the first craft breweries in America to offer their beer exclusively in cans. “When Nico and I started selling beer outside our pub in San Francisco we knew as much about that as selling hats. Having Dave join the 21A has taken us from our humble beginnings to where we are today. It’s as big time as it gets,” adds co-founder and Brewmaster Shaun O’Sullivan. As President, Wilson will oversee all aspects of the day-to-day operations of 21st Amendment’s production and business departments at the brewery offices, the company’s partner brewery in Cold Spring, MN and the San Francisco brewpub. Wilson will also be closely involved in the development of 21st Amendment’s new production brewery opening this fall in San Leandro, CA. In 2000, Freccia and O’Sullivan opened the doors to the 21st Amendment brewpub in San Francisco’s historic South Park neighborhood with Freccia managing the restaurant and O’Sullivan spearheading the brewing process. In addition to quickly becoming one of the city’s favorite pubs, 21st Amendment began expanding beyond the Bay Area by helping to pioneer the movement to canned craft beer. Known for their witty names and delicious brews, 21st Amendment offers three year round selections, as well as seasonal offerings and their infamous ‘Insurrection Series’, a once-in-a-while limited edition release. Today, 21st Amendment is among the top 50 craft beer brewers in America and is sold in 17 states.